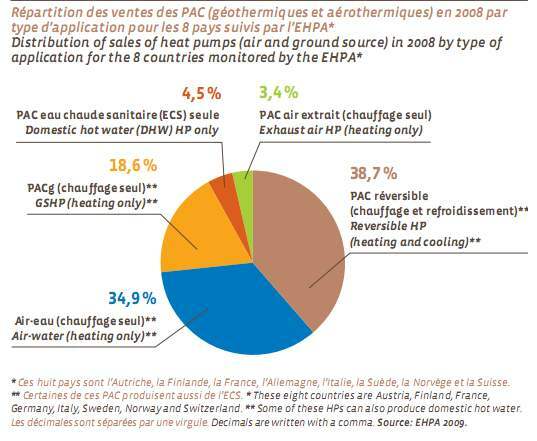 As Eurobserv’ER published a market barometer for heat pumps I thought it might be the occasion to have a look at this most interesting and promising technology which already accounts for nearly 9 GW th of capacity in Europe. With over 100,000 systems installed every year throughout the European Union, heat pumps can both heat and cool houses or buildings in an efficient and environmentally friendly way. With ten percent of growth the market already represents 780,000 systems installed in the 27 country-members. No doubt it will continue to expand. In Europe, the heat pump (HP) is a fully recognised and proven technology whose primary function is to provide residential heating. Accessorily, HPs can fulfill other functions, because a system that provides home heating can – in certain configurations – also provide domestic hot water production. In that case top-up energy may be required. There are also HPs exclusively designed for domestic hot water production. Yet others can heat buildings in winter and cool them down in the summer and are known as reversible heat pumps. As David MacKay wrote in Sustainable Energy – without the hot air, heat pumps are particularly efficient as one watt of electricity can bring from three to five watts of thermal energy. This technology thus represents a fantastic technology that would enable us to both cut our energy consumption and greenhouse gases emissions. Like district heating and combined heat and power, heat pumps are already widely used in continental Europe, but strangely rare in Britain. Heat pumps are back-to-front refrigerators. Feel the back of your refrigerator: it’s warm. A refrigerator moves heat from one place (its inside) to another (its back panel). So one way to heat a building is to turn a refrigerator inside-out – put the inside of the refrigerator in the garden, thus cooling the garden down; and leave the back panel of the refrigerator in your kitchen, thus warming the house up. What isn’t obvious about this whacky idea is that it is a really efficient way to warm your house. For every kilowatt of power drawn from the electricity grid, the back-to-front refrigerator can pump three kilowatts of heat from the garden, so that a total of four kilowatts of heat gets into your house. So heat pumps are roughly four times as efficient as a standard electrical bar-fire. Whereas the bar-fire’s efficiency is 100%, the heat pump’s is 400%. The efficiency of a heat pump is usually called its coefficient of performance or CoP. If the efficiency is 400%, the coefficient of performance is 4. (…) Some heat pumps can pump heat in either direction. When an air source heat pump runs in reverse, it uses electricity to warm up the outside air and cool down the air inside your building. This is called air-conditioning. Many air-conditioners are indeed heat-pumps working in precisely this way. 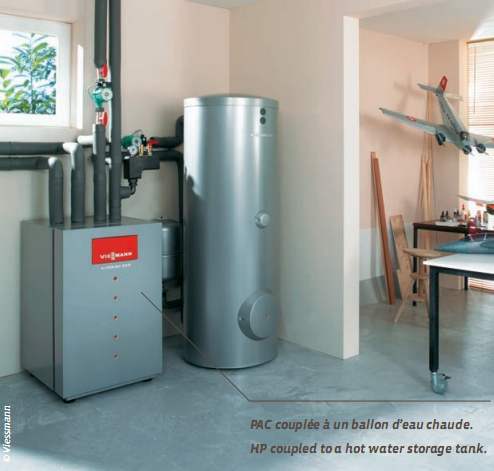 Ground-source heat pumps can also work as air-conditioners. So a single piece of hardware can be used to provide winter heating and summer cooling. Of course, before installing a heat pump in your house or building it is absolutely important to first work on both energy efficiency (weatherizing and retrofitting) and conservation (lower your thermostat and so on). Glad people are giving heat pumps a chance, as long as you can make the investment the long term savings are great both in your pocket and in reduced use of fossil fuels. After reading MacKay’s book and this study I now believe heat pumps are a crucial technology to solve both peak oil and climate change problems.